No tengo palabras para agradecer todos y cada uno de los comentarios que me han enviado, y su consuelo. Les comparto este obituario que escribí para Rita. Está en inglés, quería que apareciera en la prensa inglesa pero no encontró lugar. Lo subo entonces aquí, hoy que se cumplen dos meses desde su partida. Les aviso también que el próximo 2 de junio le haremos un homenaje en el Claustro de Sor Juana, en el DF, a las 7 p.m. Más adelante subiré la invitación. Gracias de nuevo, con todo mi corazón. I have no words to thank each and every of the comments you have sent me and the comfort they’ve brought. I share with you this obituary I wrote for Rita. It did not find a place in the British press, so I upload it here today, which marks two months after Rita left us. On the 2nd of June we will have an homage for her at the Claustor de Sor Juana, at 7 pm. I will upload the invitation later. Thank you again with all my heart. Rita Guerrero, leader of Mexican rock band Santa Sabina, conductor of an Early Music choir at a University in Mexico City and whose theatrical skills inspired a whole generation of actors, has died from secondary brain cancer on the 11th of March 2011 at the age of 46. From her youngest followers to the President of Mexico, her death has unleashed an outpouring of tributes in her country and abroad to one of the most uncompromising and gifted artists ever seen on the Mexican stage. Guerrero was born in the city of Guadalajara in 1964, where she studied music and became part of the experimental theatre project “S”. She moved to Mexico City to study theatre at the Centro Universitario de Teatro. Her participation in the student strike that shook the National University in 1987, leading to the formation of a Students Congress, made her meet other radical artists and changed the course of her career. Under the direction of David Hevia, she acted on Jerzy Grzegorzewski’s America and Hevia’s Vox Thanatos, which left their mark on a cohort of actors–on hearing news of Rita’s death, Gael García Bernal stated that seeing these plays as a boy made him wish to become an actor. America and Vox Thanatos included live music originally composed by experimental jazz-rock musicians then in their teens. Guerrero sang, and their musical affinity made them form the band Santa Sabina. Their first performance in 1989 electrified the audience with their complex music and Guerrero’s vocal feats. They soon became a cult band, and though Rita kept on acting in film and theatre, from then on she devoted most of her efforts to music. Santa Sabina’s concerts were otherworldly three hour events, enhanced by Guerrero’s theatrical experience. Stage design was usually the labour of her and artist-friends who worked with scant resources to stunning results. Their experimental compositions and Guerrero’s mesmerizing force as a performer led King Crimson’s Adrian Belew to produce their second album, Símbolos. A few years later, when the band was King Crimson’s opening act, KC’s hard-to-please founder Robert Fripp praised their sound’s purity –a quality that Guerrero harnessed seamlessly to her Early Music work. Santa Sabina performed often in America and had a series of European appearances. They went into hiatus in 2004, after five studio albums. While still working with the band Guerrero built a repertoire of Early Music and founded the Galileo Ensemble that recorded two albums. Their interpretations, both virtuous and fresh, of Sephardic songs, music from Medieval Spain and the Mexican viceroyalty earned them the respect of a diverse audience. Guerrero was also known for her activism as an outspoken supporter of the Zapatista 1994 uprising in Southeast Mexico, and later of candidate López Obrador during the disputed 2006 Presidential Elections. In 2005 she became conductor of an Early Music Choir at the Universidad del Claustro, a former convent where 17th Century Mexican poet and nun Sor Juana Inés de la Cruz lived. Guerrero unearthed valuable music from the viceroyalty era and produced several theatrical music projects. The choir’s first album was launched last year. When in January 2010 Guerrero was diagnosed with breast cancer, her enthusiasm for music did not diminish in the least—she was still working a month before her death. In May that year she was behind the staging of the show Música Divina, Humanas Letras. Rita conducted the choir and played a character in dialogue with Sor Juana, bridging the gap between the 17th and 21st Centuries—a fitting conversation between two unconventional Mexican women whose lives and work walked the thin line that separates the sacred from earthly fulfilment. 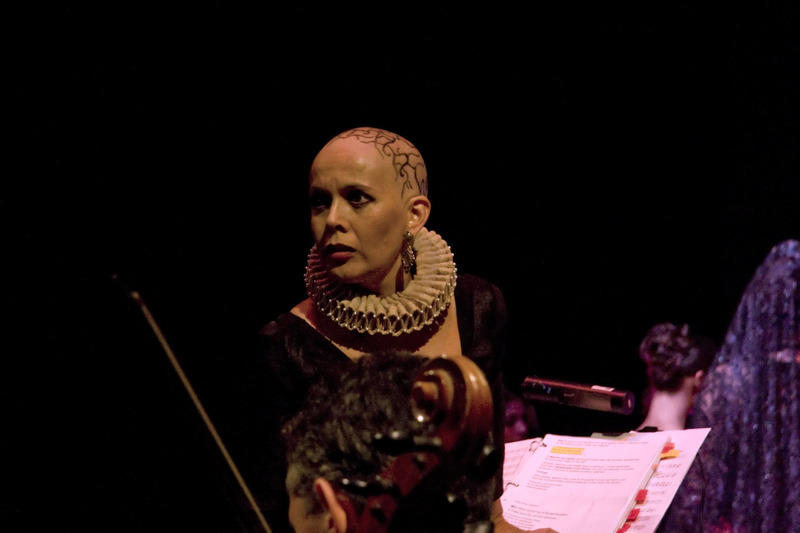 Guerrero used the loss of hair from chemotherapy as a prop to enhance the androgynous ambiguity her character called for. Last December, 22 Mexican rock bands played at a concert to raise funds for her treatment of what by then had become brain cancer. Rita gathered all former members of Santa Sabina and closed the concert, singing until the small hours. On her death, some 2,000 people queued in the street around Sor Juana’s chapel were her wake was held, and which had not been used to honour a public figure on such an occasion for 50 years, in order to pay their respects. She was lying on a bed of flowers, surrounded by candles and music, just as she loved to be onstage. Leader of a ‘cult’ band, a free spirit who built her life’s work on the fringes of the mainstream, she might have been surprised at the way her talent has been honoured by even the most official organs of Mexican culture and show-business. It is easy to imagine her ironic laughter at the condolences sent to her family by President Felipe Calderón, whose mandate is still tainted by the suspicion of fraudulent elections. Rita Guerrero’s family and friends grieve for a generous, brave and loving woman who, despite her iconic status in Mexican culture, never cared about stardom, fame or riches. As she always said, all she wanted was to create and share beauty. She is survived by her partner Aldo Max Rodríguez, former member of Santa Sabina, and her son Claudio, who turned five the day after her death.